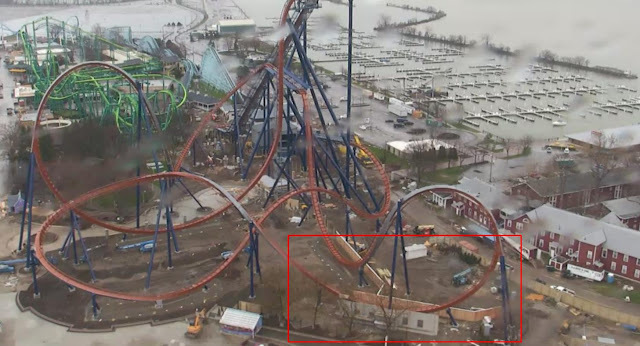 When Cedar Point hinted they where keeping a secret about Valravn, the internet responded in shock. A local news story hinted the the park still have a few secrets about their newest roller coaster which hadn't yet been made public. Users online quickly checked the webcam and it appears the new ride will come with some kind of tunnel or trench, a themed element to the ride which wasn't hinted at in the original designs. Cedar Point is keeping this new element a close secret but it's obviously under construction as you read this! So? What can it be? The quick, easy answer is that it's likely a pass-though building themed to the element of the ride. The truth? We're honestly not sure yet but this is a common design element with roller coasters, which often feature tunnels or trenches to give an added thrill to the attraction! However, if your read This Piece from Michigan Live, you'll catch a quick clue- Cedar Point has said these is a part of the queue line, something which 'Cedar Point has never done before'. Which leads me to believe that the queue line may pass right thought or beside this structure. By doing such, it would let guests get an additional, up close peek at the ride as the coaster train passes though. All speculation is abound! Until official word comes from the park, I'm going with this general idea!